To conceal or not conceal that is the question. The MCPPA certainly allows for you to carry your firearm in an open carry mode or concealed, I believe in this right and I support it as a personal choice, but from my own experience carrying concealed is the best option in most situations. 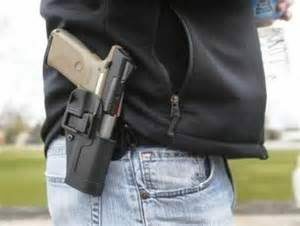 Experts agree it is easier/faster to retrieve your firearm from an open carry position, and I agree, however with proper equipment and practice, drawing from concealment is efficient and the benefits outweigh the slightly faster retrieval times for open carry. While carrying openly may deter some threats to your safety, I believe more often than not, carrying openly attracts those threats that think they can get your firearm away from you and cause more harm. 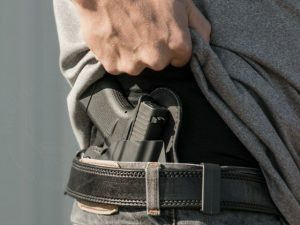 I also have found that the attention that open carry attracts from private citizens is largely those that want to express their belief that you should not be allowed to carry your firearm period, the teachable moment with citizens that have questions related to carrying are few and far between. I may be shy and avoid attention in most situations, and this may also be why I appreciate the anonymity that comes with carrying concealed: citizens, security officers, law enforcement I’d just as soon as they all not give me a second look, and if that person that decides to try and do me harm, is surprised by my armed response to their attempt to do me physical harm, all the better. 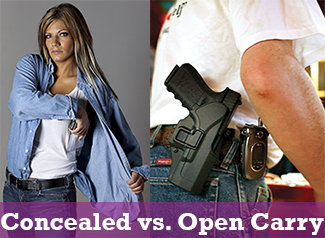 Don’t get me wrong, I fully support your right to choose how you carry your firearm, but for me, it will be concealed….most of the time.